Kaidie goes ON, and ON, and ON… for 12 minutes in CLAUDIA TOMAZ’S London Ground film ‘KAIDIE AND THE MEANING OF LIFE 3.0′ EPISODE 1. WATCH and VOTE NOW! Claudia at work filming Kaidie at work. Other images are screenshots of related websites (see links below). Multiple-award-winning filmmaker CLAUDIA TOMAZ (Locarno!! Venice!!!!!!!!!!!!) has made a film about Kaidie. This is Episode 1 of 2, in which Kaidie talks about her Rough Guide To The Meaning Of Life 3.0: Kaidie’s 1000-day Trans-dimensional Run 12.12.02009 – 09.09.2012. And talks. And talks. AND talks. For ALL 12 minutes. YOU HAVE BEEN WARNED! Episode 2 coming soon! (EVEN) More yakking!! Take a look at the film and do vote for it! The music that you can hear is composed by award-winning PHILIP TAN (Animal Farm, National Day Parade 2008, Football! Football! 2010). The film was shot 24 June 2010, at the Slade Centre of Research of the Slade School of Dine Art, Nondon, when Kaidie was installing her meta-map wall installation. You, My Dear Reader, are not unfamiliar with Claudia, a filmmaker-artist-writer-performer-activist who also spins under the name Cloud 9. You have seen her contributions here, there, there too, there there too, as well as here, just to name a few! And there are many more in Life 2.0! Claudia is one of Kaidie’s most constant co-runners of this quest. Her thought-provoking feedback, insights and suggestions have pushed Kaidie and her adventure in many exciting ways, making her otherwise silly journey worth travelling. The Do It With Others (DIWO) ethos of this work also underlies Claudia’s LONDON GROUND series, of which the film on Kaidie is a part of. London Ground is a collection of films ‘made in collaboration with selected artists of different practices (music, film, art, activism) in London underGROUND 2010. The artists invited are not mainstream ones, but people with dreams and their feet on the ground,’ according to the artist. Have a peek into the multilayered world of Claudia! Read about the LONDON GROUND series! 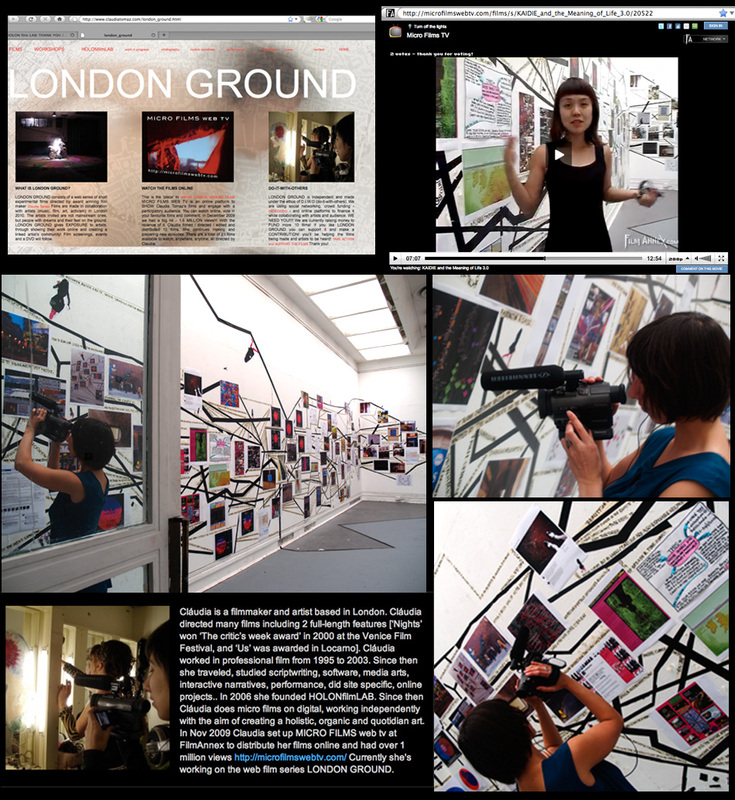 Take a look at the blog the Holon Film Lab! Take a look at notes related to the film on Kaidie! Have a look at the next chapters of cinema and see how you can contribute or make use of this system as well! Claudia tweets as well – follow her ‘live’! Check out Claudia’s work-in-progress (talk about multi-tasking)!! Look at notes about her previous book Mobile Narratives! How did the 2 travellers meet? What does Kaidie make of some of Claudia’s work? Find out in the next posts! Booked doublefaced: This week, Kaidie's Facebook profile picture is that shot by Claudia; guess who shot Claudia's picture? This entry was posted on Tuesday, July 20th, 2010 at 07:20	and is filed under DOING IT WITH OTHERS, PRESS COVERAGE and tagged with between life & death, layers of lives, meaning of life, travelling. You can follow any responses to this entry through the RSS 2.0 feed. You can leave a response, or trackback from your own site.